Hey man people have lifes here so can you just be patient a bit. I Will send you good dds and rfm a bit later. im having trouble getting the Spyder evo and the Acura ARX to show up in the show room, and when on track they only show a grey temp car. [BAR] //forward upper arm name=fr_fore_upper (used in steering lock calculation) Is specification posbody=body negbody=fr_spindle pos= (- 0.477, 0.152, -1.345) neg= (- 0.730, 0.160, -1.315)? Oh yesterday, V8-s had two! Suddenly, it's just half the pipes they used to have. The right cylinder bank is out of puff. It has no pipe, so suddenly. Please fix the exhausts for Courage, like yesterdaehehehey. 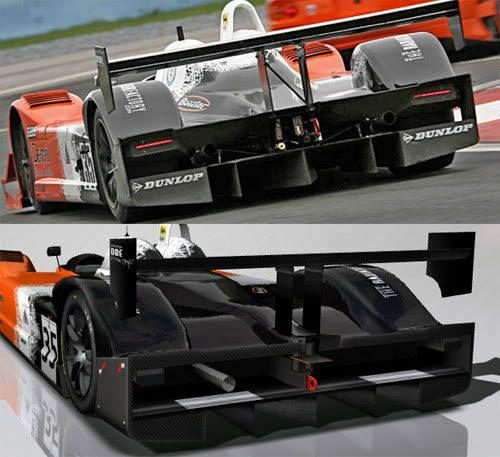 Dyson Porsche Evo (07 and 08) skins have 'double' Porsche badge on the nose. just a stupid thing, probably thanks using special UI: when i watch replays (not in replay menu, just immediate replay "in garage") i can't leave panel for view replay in complete fullscreen. I don't know if is it clear lol is difficult to explain it. In other mods when you click "enter" you can remove the panel and you can watch replay without it. Yes it's a UI limitation already identified and will be fixed in the future patch. 2) dunno what is but..looks strange, can be a mapping problem? Just a little consideration about GT2 cars performance (dunno if is it the same for other categories): watching laptimes in official thread here or in rFrank.com, i see GT2 cars are a bit faster compared to real cars. Yeah probably tracks are not 100% accurate but, imho are a bit faster. Is not a critic, just a personal consideration. Physics before SP1 was better at this point, cars were slower (but again imo faster than real ones). OT finally i bought a G25 and is just great. Feeling is great, and i really like this mod a lot more! It's possible the GT2 are a little bit faster than real, I think they are more "easy" to drive than the GT1 in the mod in comparison, less power, so better to be fast at the limit and in acceleration. this is corrected and included in the upcoming patch. This problem has been raised by some others, but I have not seen a response for how to fix it. I installed the full install with SP1 (1.2GB download) in C:/program files/rFactor. The Mod loads, and I have no problems with most of the cars. They appear properly in the showroom and on the track and I am able to drive them - offline and online. The Porsche Spyderr EVOs will not appear in the showroom. I receive several messages about various textures being missing, including WCCARBODY. I believe someone suggested editing the rFactor config file to make sure it specifies DX9. However, this sounds like a bigger problem. My video card is an nVidia 8800 GTX card. I have not had this problem with other MODs. I am beginning to think I should uninstall rFactor and start over, but before I do that I thought I would check here first to see if there is another solution. Thanks for any assistance, and thanks for this Mod. I love the GT1 Corvette which I have been able to dirve without any problems. Why do you edit the cfg file? Why not just launch rF Config.exe and select DX9 there. The RS-Spyder problem only occurs when running with DX7 as far as I've heard. 8800 GTX should run DX9 with no problems. Please report if that helps or not. I have not edited the config file. Someone suggested that the config file may have the relevant setting as "automatic" instead of "DX9," and that setting could be changed to "DX9." But I have not done anything to the config file. I will try your suggestion first, and report the results. It will be later tonight after work. OK, just got home and started the rFactor config.exe file. It did show DX7, so I changed it to DX9, and everything seems to be working now. All cars load in the showroom and on the track. Thanks for your help. Not sure if this was reported before. Some suits are very pale, no matter what you do with the texture. Black looks like pale grey, yellow turns beige etc. 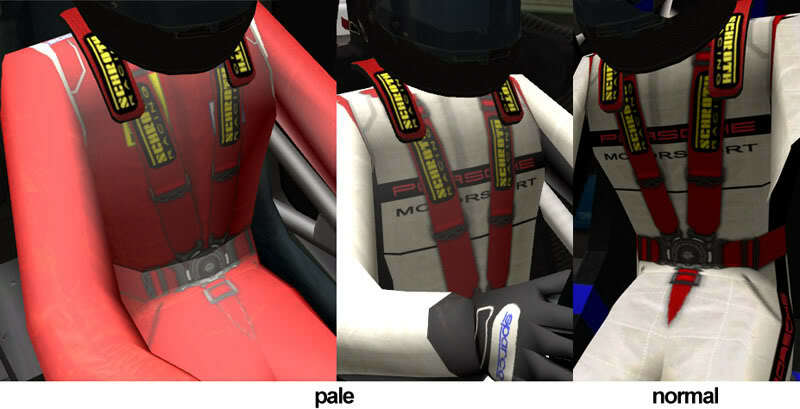 I found this problem with Ferrari, Aston and Panoz. This is at DX9 with gfx on full, WinXP, GTX260.